Clear vinyl. 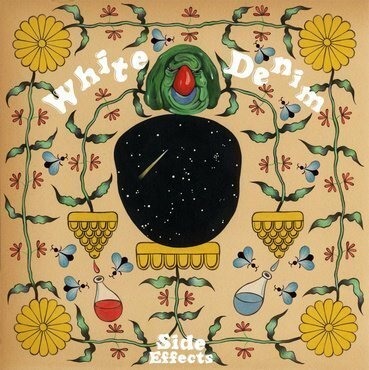 Less than a year after their last album Performance, the ever-prolific White Denim are back with their eighth record Side Effects. More in line with the experimental, freewheeling spirit of their fan-favourite record Last Day of Summer than anything else they’ve done since, Side Effects is a record that captures the essence of the band’s full-throttle live shows. Featuring a rotating cast of band members led by James Petralli and Steve Terebecki, these tracks draw on the sounds of different personnel to create a cohesive whole – the result being an album that’s as varied and vivacious as anything they’ve ever done. If you’re coming back to White Denim after a few years away, Side Effects most likely picks up exactly where you left off: a record showcasing a hugely energetic band bursting at the seams. And if you never checked out, then Side Effects is instead a wholly rewarding record – one that celebrates every form of White Denim to date and sets the stage for a brand-new chapter.